Jason Mraz in Concert! - Otter Productions Inc. | Otter Productions Inc. Jason Mraz in Concert! - Otter Productions Inc.
Home » Christopher Cohan Center » Jason Mraz in Concert! 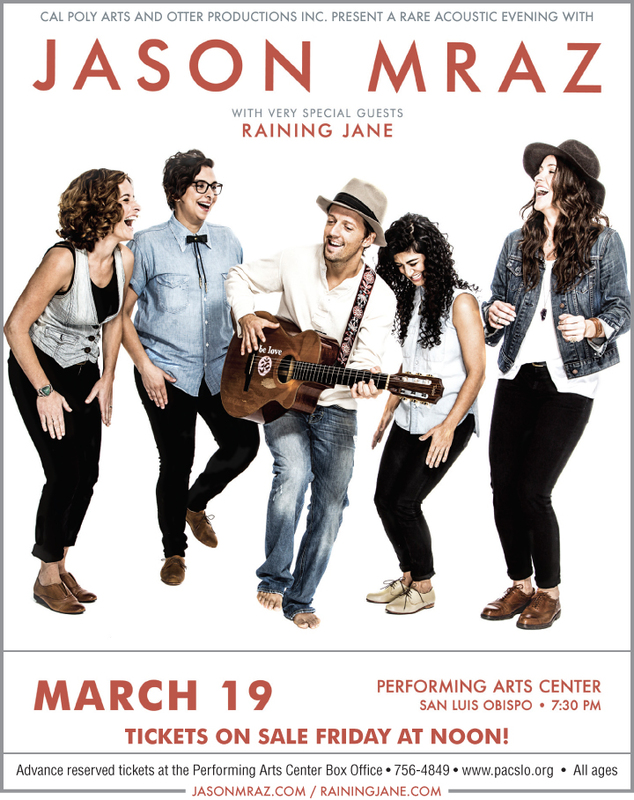 Cal Poly Arts and Otter Productions Inc. are pleased to announce that recording artist JASON MRAZ will be stopping at the Performing Arts Center/SLO at 7:30 p.m. on Wednesday, March 19, 2014 with a new acoustic tour that offers fans the rare chance to catch the Grammy Award-winning singer/songwriter in an intimate setting. Performing with Mraz are close friends, Los Angeles-based Raining Jane. 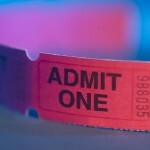 Tickets on sale as of noon, Friday, February 21 at the Performing Arts Center Ticket Office, (805) 756-4849, order on line at: www.pacslo.org. Jason Thomas Mraz (/məˈræz/; born June 23, 1977) is an American singer-songwriter who first came to prominence on the San Diego coffee house scene in 2000. At one of these coffee houses, Mraz met percussionist Toca Rivera and released Live at Java Joe’s. He released his debut album, Waiting for My Rocket to Come, which contained the hit single “The Remedy (I Won’t Worry)”, in 2002, but it was not until the release of his second album, Mr. A-Z, in 2005, that Mraz achieved major commercial success. The album peaked at number five on the Billboard 200 and sold over 100,000 copies in the US. In 2008, Mraz released his third studio album, We Sing. We Dance. We Steal Things. The album debuted at number three on the Billboard 200 and was a commercial success worldwide, peaking in the top ten of many international charts. Mraz’s international breakthrough came with the release of the single “I’m Yours” from the album We Sing. We Dance. We Steal Things. The single peaked at number six on the Billboard Hot 100, giving Mraz his first top ten single. The song was on the Hot 100 for 76 weeks, beating the previous record of 69 weeks held by LeAnn Rimes’ “How Do I Live”. The song was a commercial success in the US, receiving a 5x platinum certification from the RIAA for sales of over five million. The song was successful internationally, topping the charts in New Zealand and Norway and peaking in the top ten of multiple international charts. Jason Mraz was born and raised in Mechanicsville, Virginia. He is of Czech descent through his grandfather, who moved to the United States from Austria-Hungary in 1915. His surname is Czech for “frost” (Czech: mráz). His parents, Tom (Tomáš) Mraz and June, divorced when he was four years old, but he asserts that he had an idyllic childhood, saying, “My hometown of Mechanicsville was very American. There were white picket fences, a church on every street corner, low crime and virtually no drug use. It was a good place to grow up.” He went to Lee-Davis High School and The American Musical and Dramatic Academy (AMDA) in New York. Tickets on sale as of noon, Friday, February 21 at the Performing Arts Center Ticket Office, (805) 756-4849, order on line at: www.pacslo.org.